In addition, the network in which operates nested KVM should be switched to Promiscuous Mode. As already mentioned, KVM server is a standard CentOS 7 installed as a minimal install. 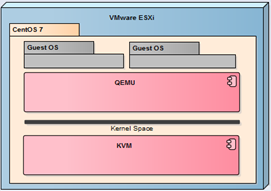 In such a system, we have crafted a few steps to run a fully functional QEMU/KVM server. Start by install the appropriate packages. Then we proceed to the network configuration inside the machine. KVM functions as a router, virtual machines inside KVM communicate with the outside world using a standard, bridging network using NAT (in this example we will not use Open vSwitch). For Linux to function as a router, it must allow forwarding packets (IP forwarding). Create a file /etc/sysctl.d/99-ipforward.conf with the contents: net.ipv4.ip_forward = 1. 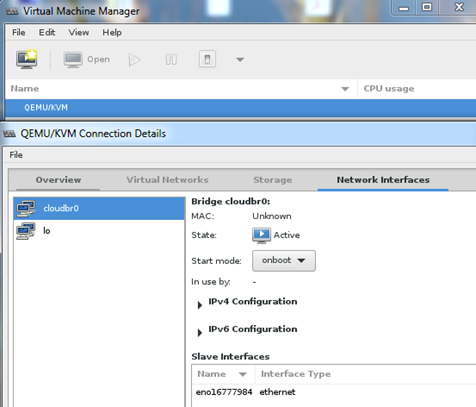 As you can see, we create a bridge to which move the IP address, from now all communication will go through a cloudbr0. This command (nmcli) is of course Natwork Manager CLI, we can do the same using interfaces files in /etc/sysconfig/network-scripts. Thus prepared, we can restart the server to ensure that all changes are active. Test can be performed using virt-manager, so you need Xming on Windows Workstation. In the main window, click “Details” on QEMU/KVM. QEMU/KVM is working properly, the bridge is visible and connected. From this point you can create virtual machines (manually), or connect the server into CloudStack and go to the next level of virtualization. 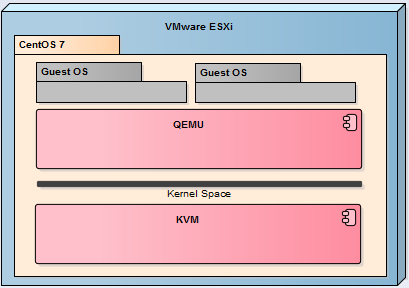 Just a note: Vmware esxi don’t support nested virtualization (https://kb.vmware.com/s/article/2009916), even that `lsmod | grep kvm` shows kvm and kvm_intel modules, KVM will not run properly – cpu issues on guests (can’t boot, install etc.). Disabling “Hardware virtualization” will force the use of QEMU wich is sooooooo slow. This KB says about the lack of support for production environments. It does not change the fact that nested virtualization works very well in all versions of ESXi. Strange things you write, I repeatedly started virtual machines in nested ESXi / KVM and everything worked fine.